For a large and high-profile organization, a sexual harassment claim developed into a complex fraud case with an investment into employment litigation investigation services. Employment litigation cases can result in fines, damages and a negative impact on reputation. The client in this matter, a high profile business, sought the assistance of RAS to uncover information to aid in the resolution of a case that could be highly embarrassing and expensive. Although the nature of the case was sensitive, the investigation revealed information which would later discredit both the plaintiff and her allegations, as well as the key witness, thus resolving the matter. The client approached RAS when an employment suit was filed against the client and a key executive within the company. The specific claims were a cause of concern to the organization, who worked hard to build a respected reputation amongst their clients and in their community. Computer records, social media, data, records and interviews were a few of the collection efforts that were required to complete the work. Collected information needed to create a coherent narrative of the events through the eyes of the data. In preparing for court, RAS used appropriate measures, including electronic data collection techniques to prepare information for court, working alongside counsel. Employment litigation events are sensitive topics in a workplace where employees have relationships. RAS needed to delicately and responsibly manage the workplace environment, as to not create additional challenges for the client or current employees. The solution RAS Consulting & Investigations came up with combined digital forensics, employee interviews and obtaining information directly from Facebook’s server logs. When talking to current employees and conducting an investigation within an active workplace, it’s important that RAS conduct itself in such a manner so as to not impact ongoing operations. Through detailed investigation and professional interactions, RAS was able to obtain an impactful body of data that changed the case, while supporting efforts to maintain stability of the company culture. The plaintiff’s case was built on misinformation and fraudulent actions that were discovered by RAS. Because of the investigative work performed, it was revealed that the case against the client was an act of fraud, verified by information discovered through computer forensics, electronic research, and in-person interviews. This crucial data not only allowed the client to protect themselves in the case filed against them..
As demonstrated by this data, $125M in monetary benefits were paid out by U.S. companies in 2016. 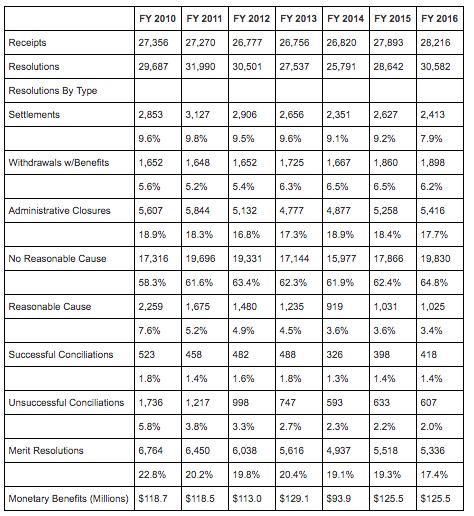 These figures only represent harassment claims and not other violations protected by the EEOC such as discrimination. As a business, it is essential to understand your options in responding to employee litigation claims and the value of investigation in uncovering discrepancies in claims and ultimately cost and liability savings. Typically, how you immediately interact with these agencies may start your case off on a good or bad foot. Like any incident in the workplace, it is important to act immediately to employment claims. Engaging legal counsel and an investigator early-on may eliminate need for litigation entirely. Are You Prepared to Respond to an Employee Litigation Event?